Q: How much is the Kaffara (Penalty) for not fasting in Ramadan? A: It is a great sin to eat or drink during the days of Holy Ramadan, or deliberately commit acts which break the fast without a justifiable reason. Anyone who leaves out a fast purposely have to give Qaza as well as Kaffara. (3) To feed 60 poor. If you choose to fast for 2 months (60 days) as Kaffara, you will have to fast for 31 days together and thereafter, you can complete the balance of 29 days in your own time. However, you will not begin fasting your 31 days when you know there will be a day in between when it is Haraam to fast; e.g. You will not begin fasting your Kaffara at the beginning of Zilhajj as on the 10th of Zilhajj [Eid-ul- Hajj] it is Haraam to fast. (2) Attributing lies to Allah, His Prophets and the Imams. Then he or she will have to give ALL the three above said Kaffara together. Muslims derive therapeutic and spiritual benefits starting from the Wudu to the physical movements in the Salat-Takbir, Qiyam, Ruku, Sajda, Jalsa, and Tasleem. We perform five daily contact prayers (Salat) and voluntary prayers (Sunnah, Nafl) throughout the year and Taraweeh prayers during the month of Ramadan. This results in moderate physical exercise particularly to every muscle in the body. Some muscles contract isometrically (same length) and some contract in approximation or isotonically (same tension). The energy needed for the muscle metabolism increases during the performance of Salat, resulting in a relative deficiency of oxygen and muscle nutrients. In turn this deficiency causes vasodilatation - an increase in the caliber of blood vessels, thereby allowing blood to flow easily back to the heart. The temporarily increased load on the heart acts to strengthen the heart muscle and to improve the circulation within the heart muscle. During the month of Ramadan, additional prayers are performed after salatul Ishaa, called Taraweeh prayers which vary from eight rakat to 22 rakat. There's a few minutes break after every four rakat for chanting and extolling the Majesty of Allah. After Iftar the blood glucose level continues to rise from the food ingested. Just before the Iftar meals, the blood glucose and insulin levels are at their lowest level. After an hour or so after the Iftar meal, the blood glucose begins to rise and also plasma insulin. The liver and the muscles take up the circulating glucose. The blood sugar reaches high levels in an hour or two and the benefits of Taraweeh prayers come into effect. The circulating glucose is metabolized into carbon dioxide and water during the Taraweeh prayers. Hence, the Taraweeh prayers help in expanding the extra calories and improve flexibility, coordination, reduce stress-related autonomic responses in healthy persons, and relieve anxiety and depression. The gentle exercises performed in Taraweeh prayers improve physical fitness, emotional well-being and increase the longevity of the Namazi (one who performs the Salat or Namaz). When a little extra effort is made, as in performing the Taraweeh prayers, there will be a betterment in the endurance, stamina, flexibility and strength. It was noted that the five daily prayers (salat) produce the same physiological changes without any undesirable side effects as those produced by jogging or walking at about three miles per hour. Recent research studies performed on 17,000 Harvard alumni who entered college between 1916-1950 gives strong evidence that only moderate aerobic exercise, equivalent to jogging about three miles a day, promotes good health and may actually add years to life. Men who expended about 2000 kcal of exercise on a weekly basis (equal to a daily 30 minute walk, run, cycle, swim, etc.,) had one-quarter to one-third lower death rates than classmates who did little or no exercise. In addition to the health-boosting qualities of the salat (Namaz), the Namazi will be trained to be ever-ready for any unexpected physical exertion such as sudden lifting of children, chairs, or catching a public transportation vehicle. The elderly will accomplish this more securely and efficiently. Hence, this is an advantage for the elderly to maintain their physical fitness for a longer period of time. It has been observed that those who fast and perform the Taraweeh prayers report feeling much convalescing and robust. As human beings grow older, their physiological activity diminishes. As a result, their bones become thinner, and if not taken care of, will suffer from Osteoporosis. This condition causes the fractures of the bones in the elderly when they fall due to a loss of bone mineral content and consequent sponginess of the bones. The bone then becomes structurally unstable, brittle and susceptible to fractures. Primary osteoporosis is most common among postmenopausal (due to reduction in estrogen) women or those who have undergone a bilateral ocphorectomy (both the ovaries removed). Women are six times more likely than men to develop Type I osteoporosis. The three major prevention strategies of osteoporosis are a high dietary intake of calcium and vitamin D, regular exercise and estrogen replacement in postmenopausal women. The skin also becomes fragile and crinkled. The repair processes of the body become slower and immune responses are decreased. In the elderly, their physical activity is reduced. As a result, they have lower levels of Insulin Growth Factor 1. Reserve functions of all vital organs decrease and the elderly are more susceptible to mishaps and ailments. Because of repeated and regular movements of the body during salat, the muscle strength, tendon power, joint, flexibility and the cardiovascular reserve are improved. Hence, salat and Taraweeh prayers enable the elderly to enrich the quality of life and to meet with unforeseen difficulties such as falls which could injure their bodies. Therefore, Taraweeh prayers will improve their endurance, self-respect and self-confidence in being self-reliant. Adrenaline is secreted even by minor activity. The secretion outlasts the incitement. Even after the Taraweeh prayers are over, the effects of adrenaline and noradrenaline are manifest. Adrenaline, also called epinephrine, is produced by the adrenal glands. The middle part of these glands, the adrenal medulla, secretes the hormone, which is chemically almost identical to the transmitter substance noradrenaline produced at the ends of sympathetic nerves. Adrenaline secretion into the bloodstream in stress causes acceleration of the heart, constriction of arterioles, and dialation of the pupils. In addition, adrenaline produces a marked increase in metabolic rate thus preparing the body for emergency. Even the thought or the intention of performing the Taraweeh prayers is sufficient to activate the sympathetic nervous system. Sympathetic nervous system (thoraco-lumber nervous system) is one of the two divisions of the autonomic nervous system, which supplies motor nerves to the smooth muscles of internal organs and to the heart muscle. Sympathetic nerve fibers arise via spinal nerves in the thoracic and lumbar regions. Their endings release mainly noradrenaline, which increases heart rate and breathing rate, raises blood pressure, and slows digestive processes, thereby preparing the body for "fight or flight" and antagonizing the effects of the parasympathetic nervous system. The adrenaline would re-distribute the blood in the body to the active muscles, mobilize liver glycogen if necessary in order to provide glucose for the active tissues, diminish fatigue in skeletal muscles, facilitate alveolar ventilation by relaxing bronchiolar muscle, and would initiate cardiovascular changes. Exercise induces a more effective functioning of beta-adrenoreceptors located on cell membranes. Salat and Taraweeh prayer improve body weight control and expand calories without proportionate increase in appetite. A combination of moderate dietary restriction, both at the Sahur and Iftar meals, accompanied by the Taraweeh prayers, should achieve weight reduction. This will also reduce both fat and body weight, but fat-free weight will remain constant or may even increase slightly. Hence, during Ramadan one should not over eat at the Sahur and Iftar meals and continue to perform Salat and Taraweeh prayers in order to lose some of the excess weight. It is well known that exercise prevents coronary heart disease (CHD), increases high density lipo-proteins (HDL or healthy Cholesterol), increases maximum oxygen intake, slows the heart, lowers the B.P. slightly, decreases ventricular ectopic activity, enlarges the lumen of the coronary arteries and increases cardiac output. Exercise also improves carbohydrate tolerance and improves late-onset diabetes, and helps cases of chronic respiratory diseases. Beneficial changes have been recorded in the lipid profile, B.P. clotting factors, weight reduction and insulin sensitivity of muscles and other tissues in persons who exercise regularly. Growth Hormone secretion is elevated by fasting and it is further elevated by Taraweeh prayers. As Growth Hormone is necessary for collagen formation, this may be an important factor as to why the skin of those who fast regularly during Ramadan and perform the Taraweeh prayers do not get wrinkled, even when they grow old. It is a known fact that exercise improves mood, thought and behavior. Exercise improves the quality of life, induces greater sense of well-being and energy, reduces anxiety and depression, influences mood favorably and contributes to self-esteem and an aura of confidence; improves memory in the elderly especially with constant repetition of the ayat (verses) from the Glorious Qur'an and other Ayaat which exalt His Glory. This constant repetition of the Qur'anic Ayaat would help to screen the mind from the incoming thoughts. It has been found by a Harvard University researcher. Dr. Herbert Benson, that repetition of a prayer, ayat of the Qur'an or remembrance (Dhikr) of Allah or muscular activity coupled with passive disregard of intensive thoughts cause a "relaxation response" that leads to the lowering of Blood Pressure and decreases in oxygen consumption and a reduction in heart and respiratory rates. All these are combined in the Taraweeh prayer which is an ideal condition for "relaxation response." It combines repeated muscular activity with repetition of salat, chanting of words of glorification of Allah and of supplications. The Taraweeh prayer puts the mind in a relaxed state. This calm state of the mind may be partly due to the release of encephalins, beta-endorphins (endogenous morphines) and others into the blood circulation. Endorphins are any one of the neuropeptides composed of many amino acids, elaborated by the pituitary gland and acting on the central and peripheral nervous systems to reduce pain. Endorphins are categorized as alpha-endorphin, beta-endorphin, and gamma-endorphin which produce pharamacologic effects similar to morphine. Beta-endorphin found in the brain and GI (gastro-intestinal) tract is the most potent of the endorphins and is a powerful analgesic (pain killer) in humans and animals. For example, during childbirth many women release endorphins reducing a woman's sensation of pain. The release of endorphins is associated with an euphoria. During childbirth, women who give birth with little or no medication sometimes label this euphoria a "birth climax". Islam is the only religion in which physical movements of salat and Taraweeh prayers are combined with spiritual exercise. When salat and Taraweeh prayers are practiced throughout a person's life, recurring every few hours or so, it trains a person to undertake the difficult task of meditation during physical maneuvers of salat and Taraweeh prayers, so that the Namazi (one who performs the salat) benefits both from spiritual as well as physical exercise. Salat and Taraweeh prayers are unique in that tension builds up in the muscles during physical maneuvers on the one hand, while tension is relieved in the mind due to the spiritual ingredient, on the other hand. The following benefits have been noted among those who perform the Taraweeh prayers: burning off calories and losing weight, maintaining muscle tone and body composition, joint flexibility (stiff joints are often the result of disuse, not arthritis), increasing metabolic rate, improving circulation, improving heart and lung function and aerobic capacity, decreasing heart disease risk profile, increasing your sense of self-control, reducing your level of stress, increasing your ability to concentrate, improving your appearance, reducing depression and resistance to depression, helping you sleep better and suppressing your appetite. Evidence is also accumulating that those who perform regular Salat along with voluntary prayers can conserve and actually retard the loss of bone mass in the elderly, thus starving off the ravages of osteoporosis that afflicts both men and women. It is also possible to retard the aging process and confer some protection to health in later life. I'etikaaf is from the root word “Akafa” to adhere, cling, stick or keep. It means to engage and to devote something, to a thing, be it good or bad. In Shari'ah it means to engage in a retreat in the Masjid and stay there with the intention of seeking nearness to Allah the Almighty, and His reward. The majority of Muslim scholars agree that I'etikaaf is permis­sible, for the Messenger of Allah (saas) observed I'etikaaf in the Month of Ramadan during the last ten days. In his last Ramadan he observed it 20 days, as is related by Bukhari and others. Besides, his companions and wives observed it during his lifetime and after. 'ebadah, and the Sunnah is meritorious in the last ten days of Ramadan. The obligatory I'etikaaf is the one when a believer makes it obligatory on himself, by invoking a conditional vow, such as saying: I am vowing in the Name of Allah to engage in retreat; or if Allah cures my sick relative, I will engage in I'etikaaf. 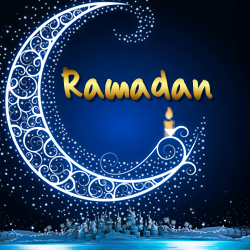 Ramadan is a source of spiritual as well as physical inspiration for Muslims. Physically, no month in our history has been more charitable and generous with victories than the month of Ramadan. 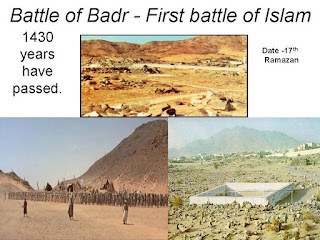 One of the more remarkable examples is the Badr campaign (Battle of Badr). This was a battle in which the forces of truth, numbering 300 men against all odds, defeated an army three times their size. 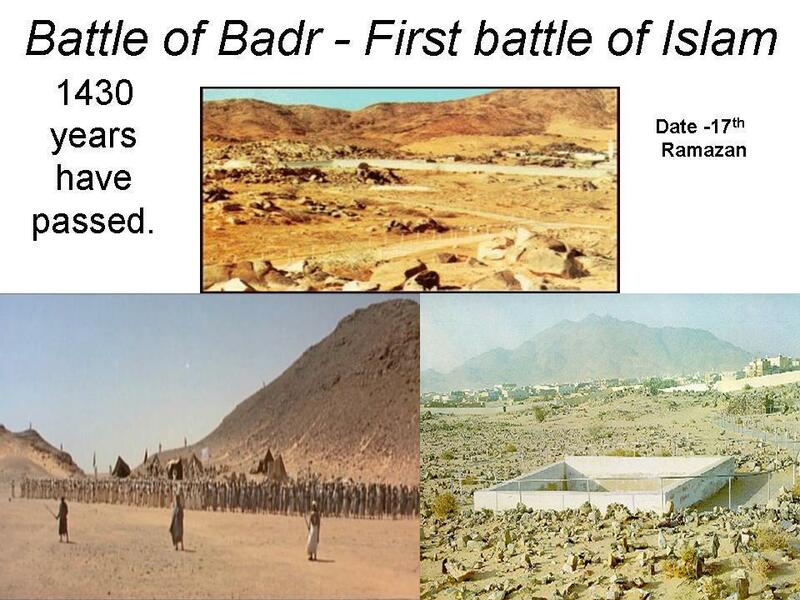 Badr is the name of a rural city about 150 miles from Madinah. The day of the battle was named the Day of Criterion, Yawmul Furqaan, for Allah set apart the distinction between truth and falsehood by aiding His Messenger and the believers against all odds, and abandoning the unbelievers. All this took place in the month of Ramadan, in the second year of Hijrah. The reason for this encounter was purely coincidental. The Messenger of Allah (saas) was informed that his old antagonist and leader of the Quraysh, Abu Sufyan, was returning from Shaam (Northern Arabia) to Makkah with many camels in a large caravan. The Messenger called upon his companions to intercept and confiscate the caravan which contained merchandise for Quraysh businessmen and women. The reason was because the Quraysh were in a state of war with the new ummah in Madinah, and because the Quraish had appropriated the wealth of the companions who were forced to flee Makkah because of their faith in Islam and suffer merciless persecution at the hand of Makkans. Furthermore, there was no treaty of nonbelliger­ence between the two parties. Abu Sufyan knew that he was being tailed so he dispatched a messenger to Makkah to inform them of the impending doom of their caravan, and urged them to swift action. Meanwhile, he drove the caravan off the desert's main highway and took a safer but longer coastal route instead, and escaped. The Quraysh, on the other hand, upon receiving this alarming news called for a general declaration of war. The Quraysh were mighty and heavily prepared. Immediately, 1000 strong men were enlisted, including their warlords and generals. They amassed 100 horses and 700 camels. Their ob­jective was to show off. The army included singers to sing ill of the Muslims and dance at their defeat. When Abu Sufyan knew of their setting out, he sent them a message that the caravan had escaped, and that there was no need for the Quraysh to continue the journey, and urged them to return to Makkah and not to fight. The warmon­gers of the Quraysh refused to heed Abu Sufyan's call and in­sisted on continuing. “O Messenger of Allah, I hope you are not afraid that ansaar will not see it incumbent upon them to join you unless the enemy is in their homes. I would like to say on behalf of the ansaar: ‘Go wherever you wish, connect the rope of whoever you wish, break the rope of who­ever you wish, take from our wealth whatever you de­sire, give us out of it whatever you wish, whatever you take from us is better for us than what you left, what­ever you command of us we shall obey you. By Allah, if you decide to travel and take us with you until you reach the pool of Ghamdan, we will travel with you. If you ask us to cross a sea and you cross it we will cross it with you. We are not afraid to meet the enemy tomor­row. We are patient in war, truthful in the battlefield. The Messenger liked the idea; he moved to the lower side with the city of Medinah at their back, and the Quraysh took the side that faced Makkah. On the eve of the battle, Allah sent a mysterious rain. On the side of the Quraish it fell heavily. It soaked everything and cre­ated very slippery muddy conditions, making it difficult for the enemy's army to move forward. Whereas on the side of the Muslims, it was a light drizzle that refreshed them and ce­mented the sand and stabilized their movement. When the battle was over none of these people missed where they were supposed to fall and die, as the Messenger had pointed out before the war. “O Messenger of Allah, a paradise whose width is like the width of heavens and earth?” The Messenger re­sponded: “Yes.” `Umair said: ‘Bakhin! Bakhin! (indicat­ing strong appreciation and acceptance) O Messenger of Allah, there is nothing between me and paradise except to be killed by these people. If I live to eat these dates that will be a long life.” Then he threw the dates away and fought until he was killed. The Messenger (saas) took a handful of sand or stones and threw them at the enemy soldiers and no one was hit by this sand but blinded them and or it preoccupied them. This was a divine intervention from Allah. The enemy soldiers could not fight after that and they were defeated. The remaining soldiers flew from the battlefield in all directions and the Muslims went after them. Seventy of them were killed and seventy were taken as prisoners of war. After the war the Messenger (saas) stayed at Badr for three days, and as he was riding his horse, on the third day, he pulled away where he came to the edge of a well. He stood and started to call the dead among the enemies by their full names and the names of their fathers. As for the prisoners of war, the Messenger asked his compan­ions their opinions. The Messenger took ransom from them. Most of them gave between four to a 100 dirham. Some provided services by teaching the Muslim children of Madinah the basics of reading and writing, others by freeing a Muslim bonds man or woman in Makkah. Some were killed because of their crimes against Muslims, while others were let go. The lessons of this battle are very obvious. An army outnum­bered three to one was victorious because it was fighting in the path of Allah, because it stood firm to raise the banner of Allah and to defend Allah's religion, so Allah helped them. Anyone who stood on the same principle, the result would be the same. Indeed, Ramadan is not a period to slacken, it is a serious time in which serious decisions are taken and higher goals are achieved.